The eurozone debt crisis was the world's greatest threat in 2011. That's according to the Organization for Economic Cooperation and Development. Things only got worse in 2012. The crisis started in 2009 when the world first realized Greece could default on its debt. In three years, it escalated into the potential for sovereign debt defaults from Portugal, Italy, Ireland, and Spain. The European Union, led by Germany and France, struggled to support these members. They initiated bailouts from the European Central Bank and the International Monetary Fund. These measures didn't keep many from questioning the viability of the euro itself. A new crisis might be brewing. On August 10, 2018, President Trump announced he would double the tariffs on aluminum and steel imports from Turkey. He was trying to obtain the release of jailed American pastor Andrew Brunson. Turkey claims he was involved in the 2016 coup to overthrow the government. The U.S. move lowered the value of the Turkish lira to a record low against the U.S. dollar. It renewed fears that the poor health of the Turkish economy could trigger another crisis in the eurozone. Many European banks own stakes in Turkish lenders or made loans to Turkish companies. As the lira plummets, it becomes less likely these borrowers can afford to pay back these loans. The defaults could severely impact the European economy. As a result, Germany is considering lending Turkey enough to prevent a crisis. If those countries had defaulted, it would have been worse than the 2008 financial crisis. Banks, the primary holders of sovereign debt, would face huge losses. Smaller banks would have collapsed. In a panic, they'd cut back on lending to each other. The Libor rate would skyrocket like it did in 2008. The ECB held a lot of sovereign debt. Default would have jeopardized its future. It threatened the survival of the EU itself. Uncontrolled sovereign debt defaults could create a recession or even a global depression. It could have been worse than the 1998 sovereign debt crisis. When Russia defaulted, other emerging market countries did too. The IMF stepped in. It was backed by the power of European countries and the United States. This time, it's not the emerging markets but the developed markets that are in danger of default. Germany, France, and the United States, the major backers of the IMF, are themselves highly indebted. There would be little political appetite to add to that debt to fund the massive bailouts needed. Launch quick-start programs to help business startups. Relax protections against wrongful dismissal. Introduce "mini-jobs" with lower taxes. Combine apprenticeships with vocational education targeted toward youth unemployment. Create special funds and tax benefits to privatize state-owned businesses. Establish special economic zones like those in China. Merkel found this worked to integrate East Germany. 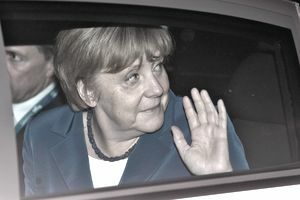 She saw how austerity measures could boost the competitiveness of the entire eurozone. Eurozone member countries would legally give some budgetary power to centralized EU control. Members that exceeded the 3 percent deficit-to-GDP ratio would face financial sanctions. Any plans to issue sovereign debt must be reported in advance. The European Financial Stability Facility was replaced by a permanent bailout fund. The European Stability Mechanism became effective in July 2012. The permanent fund assured lenders that the EU would stand behind its members. That lowered the risk of default. Voting rules in the ESM would allow emergency decisions to be passed with an 85 percent qualified majority. This allows the EU to act more quickly. Eurozone countries would lend another 200 billion euros to the IMF from their central banks. This followed a bailout in May 2010. EU leaders pledged 720 billion euros or $928 billion to prevent the debt crisis from triggering another Wall Street flash crash. The bailout restored faith in the euro which slid to a 14-month low against the dollar. The United States and China intervened after the ECB said it would not rescue Greece. Libor rose as banks started to panic just like in 2008. Only this time, banks were avoiding each other’s toxic Greek debt instead of mortgage-backed securities. First, the United Kingdom and several other EU countries that aren't part of the eurozone balked at Merkel's treaty. They worried the treaty would lead to a "two-tier" EU. Eurozone countries could create preferential treaties for their members only. They would exclude EU countries that don't have the euro. Second, eurozone countries must agree to cutbacks in spending. This could slow their economic growth, as it has in Greece. These austerity measures have been politically unpopular. Voters could bring in new leaders who might leave the eurozone or the EU itself. Third, a new form of financing, the Eurobond, becomes available. The ESM would be funded by 700 billion euros in euro bonds. These are fully guaranteed by the eurozone countries. Like U.S. Treasurys, these bonds could be bought and sold on a secondary market. By competing with Treasurys, the Eurobonds could lead to higher interest rates in the United States. Debt rating agencies like Standard & Poor's and Moody's wanted the ECB to step up and guarantee all eurozone members' debts. But the EU leader, Germany, opposed such a move without assurances. It required debtor countries to install the austerity measures needed to put their fiscal houses in order. Germany does not want to write a blank euro check just to reassure investors. German voters wouldn't be too happy about paying higher taxes to fund the bailout. Germany is also paranoid about potential inflation. Investors worried that austerity measures will only slow any economic rebound. Debtor countries need that growth to repay their debts. The austerity measures are needed in the long run but are harmful in the short term. First, there were no penalties for countries that violated the debt-to-GDP ratios. These ratios were set by the EU's founding Maastricht Criteria. Why not? France and Germany also were spending above the limit. They'd be hypocritical to sanction others until they got their own houses in order. There were no teeth in any sanctions except expulsion from the eurozone, a harsh penalty which would weaken the power of the euro itself. The EU wanted to strengthen the euro's power. That put pressure on EU members, not in the eurozone. They include the United Kingdom, Denmark, and Sweden to adopt it. Second, eurozone countries benefited from the euro's power. They enjoyed the low-interest rates and increased investment capital. Most of this flow of capital was from Germany and France to the southern nations. This increased liquidity raised wages and prices. That made their exports less competitive. Countries using the euro couldn't do what most countries do to cool inflation. They couldn't raise interest rates or print less currency. During the recession, tax revenues fell. At the same time, public spending rose to pay for unemployment and other benefits. Third, austerity measures slowed economic growth by being too restrictive. For example, the OECD said austerity measures would make Greece more competitive. It needed to improve its public finance management and reporting. It was healthy to increase cutbacks on public employee pensions and wages. It was a good economic practice to lower its trade barriers. As a result, exports rose. The OECD said Greece needed to crack down on tax dodgers. It recommended the sale of state-owned businesses to raise funds. In return for austerity measures, Greece's debt was cut in half. But these measures also slowed the Greek economy. They increased unemployment, cut back consumer spending, and reduced capital needed for lending. Greek voters were fed up with the recession. They shut down the Greek government by giving an equal number of votes to the "no austerity" Syriza party. Another election was held June 17 that narrowly defeated Syriza. Rather than leave the eurozone though, the new government worked to continue with austerity. In the long term, austerity measures will alleviate the Greek debt crisis.